If you end up looking for last minute Thanksgiving supplies next month, or are hoping to get a jump on those Black Friday sales, don't go to Costco. They won't be open on Thanksgiving Day. "Our employees work especially hard during the holiday season, and we simply believe they deserve the opportunity to spend Thanksgiving with their families. Nothing more complicated than that," a spokesperson tells Think Progress. The round-the-clock availability of Amazon shopping and other e-tailers has made more brick-and-mortar shops open their doors on Turkey Day. That's a trend that will only increase, according to analysts. But count Costco and its 127,000 employees out. 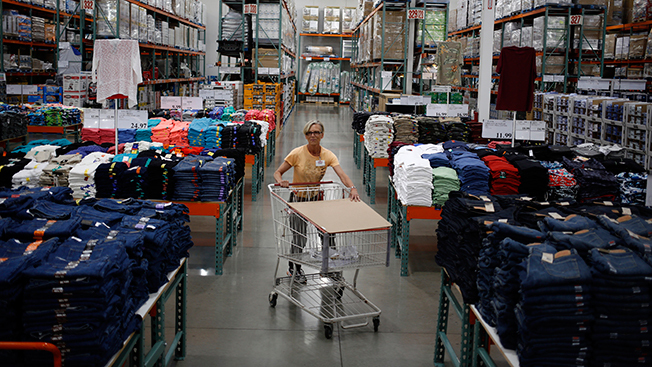 The move has endeared customers to Costo, with many on Twitter commending the move. Could it be why David Letterman told Amy Poehler that his next job would be at Costco? 36" Bears by Gund. Snuggle in heavenly softness. The brand isn't too active on social media. While it does post on Instagram and Facebook occasionally, it hasn't ever tweeted. However, its new 93-inch bear, coming later this fall (see video below), has its own Facebook fan page with 11,446 likes. Apparently Costco will be offering this 93-inch bear later this fall and employed Seattle Seahawk Russell Wilson to help promote it. The first Price Club opened in 1976 in a converted airport hanger in San Diego. The first Costco opened in Seattle in 1983. In 1993, the chains merged and operated under the name PriceCostco. The company plans to sell to China online through the Alibaba group. Costco lands at No. 19 on the Fortune 500 list for 2014.